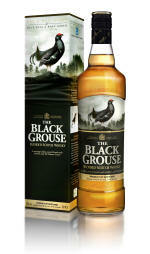 The Black Grouse is a brand with significant investment behind it this Christmas. It is being supported by a nationwide sampling campaign in 64 Sainsbury’s stores combined with major train stations to introduce the brand’s recommended serve of The Black Grouse and coke - Black & Black. This rich and flavoursome smoky whisky marries the trademark quality and smoothness of The Famous Grouse with the aromatic peatiness of an Islay Malt. The Black Grouse is an important brand extension for The Famous Grouse, appealing to Islay Malt drinkers who appreciate the smoky, peaty flavour of The Black Grouse, and taps into those drinking occasions where blended Scotch drinkers are looking for a dram with a more challenging taste. This year, The Black Grouse was awarded a Gold – Best in Class medal at the IWSC (International Wine and Spirits Competition) in the Scotch Whisky category, and in his 2008 ‘Scotch Whisky Bible’, Jim Murray hailed it as “a real treasure -the best new blended scotch whisky” awarding a total score of 94/100. In a pioneering new partnership with the Royal Society for the Protection of Birds (RSPB), 50p from every bottle sold is being donated to a conservation campaign to save black grouse across the UK. To date, £30,000 has been generated for the charity through sales of the new whisky. The Black Grouse has commenced a major sampling campaign this October and November in Edinburgh and Glasgow train stations as well as sampling activity in city centre bars and train stations in Manchester, Newcastle and Liverpool. The brand will also support Burns Night this year seeing kits go into 300 bars in Scotland with a smaller number heading south of the border in an aim of drive awareness to the brand. Victoria Jackson, Maxxium UK’s brand manager for The Black Grouse, said: “It’s been toasted by the critics, it’s flown off the shelves in other markets and after a successful launch in Sainsbury’s last year it is really starting to take off in the home market too.